JayTheBanker's Blog: Today was my turn..
Today was every bit a Monday! It was extra crazy since we'll have a mid-week holiday!! I really enjoy mid-week holidays though...don't you? 1) My birthday was last week..
2) The young lady whose birthday was immediately prior to mine had to surprise me with a birthday cake. So, today was my turn. Which means yesterday Samantha and I (mostly Samantha) made a cake! At this link I have provided to Southern Living the first video you see is the white cake. 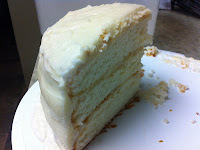 This particular cake is the 2012 Southern Living White Cake Recipe winner. Here is the LINK and here is the RECIPE.